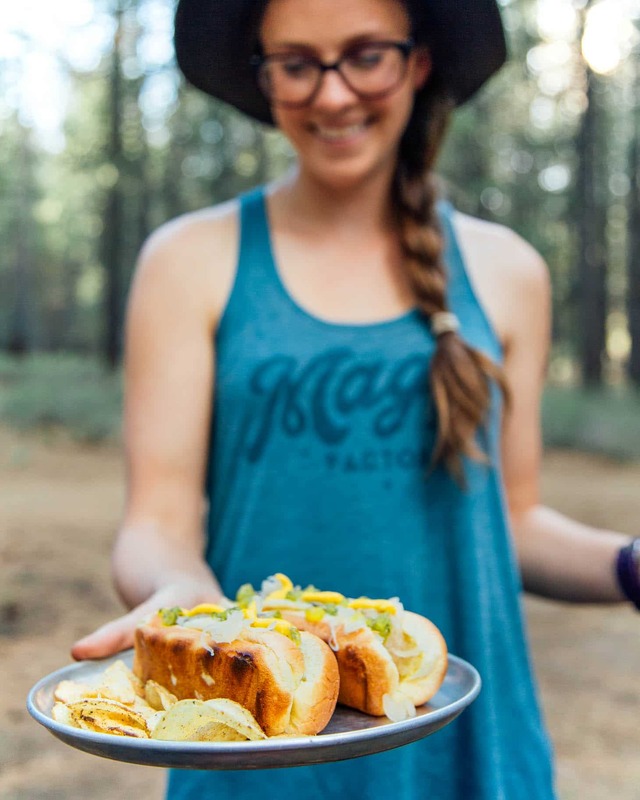 We share our tips on how to make gourmet style hot dogs on your next camping trip! 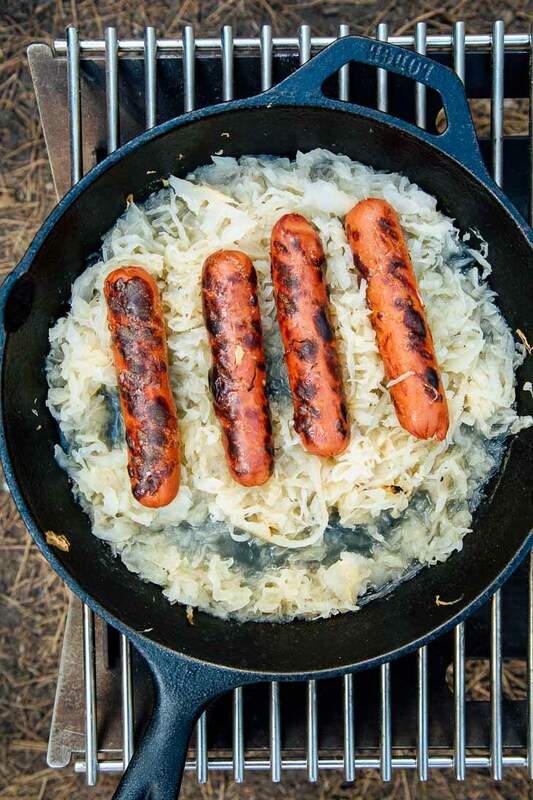 Hot dogs are a campfire classic. Perhaps one of the most iconic examples of camping food. And for good reason too. Since they’re technically precooked, hot dogs are by far the lowest stake meat to cook over a fire. They’re cheap, widely available, and there’s zero chance you might accidentally undercook them. 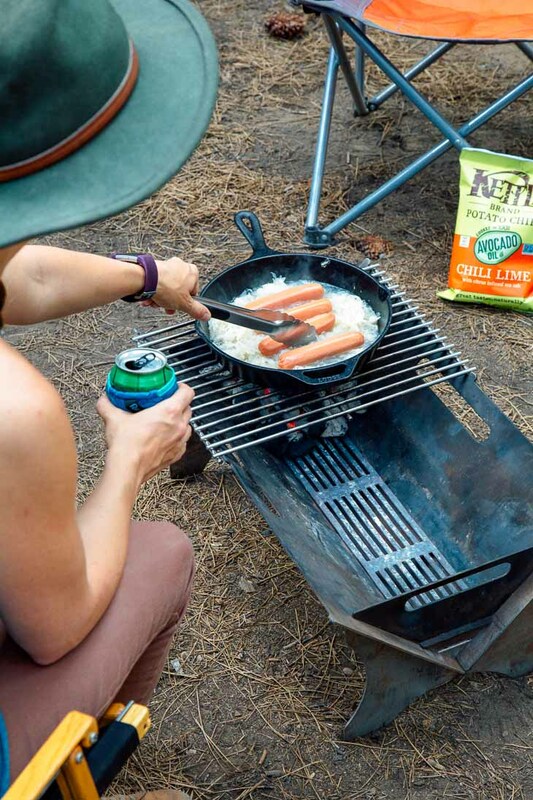 But while hot dogs are an extremely versatile camping food, we’ve had our fair share of dried out, burst skinned, heavily carbonized dogs to know it is still very possible to screw them up. Just tossing them on the grill will work most of the time, but if you really want do hot dogs right – then we have some suggestions. 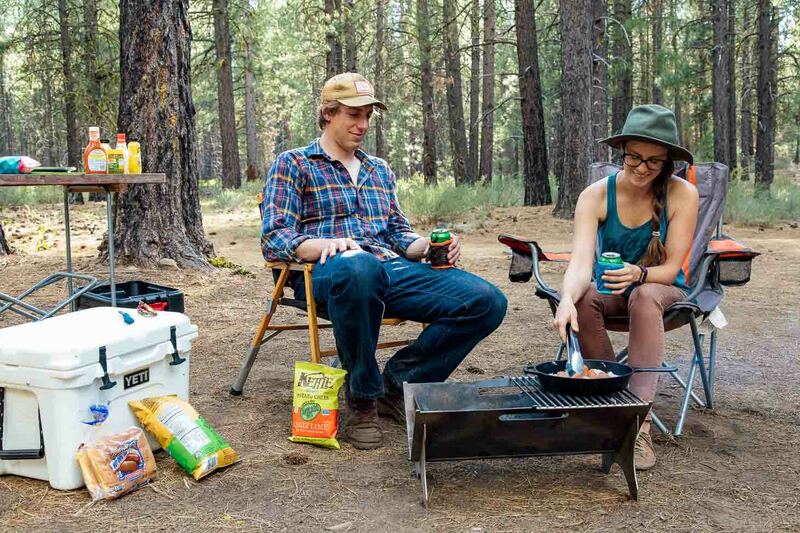 Clean the grill grate or use cast iron: We’ve been to enough campsites to know 9 out of 10 campfire grill grates are practically unusable. Years of exposure has left most of them crusty and rusty. Moral of the story, don’t count on them. If your campfire has a clean grill, great! If not you can try to give it a clean with some steel wool. But if it’s beyond repair, you can either bring your own grill grate from home and lay it on top. 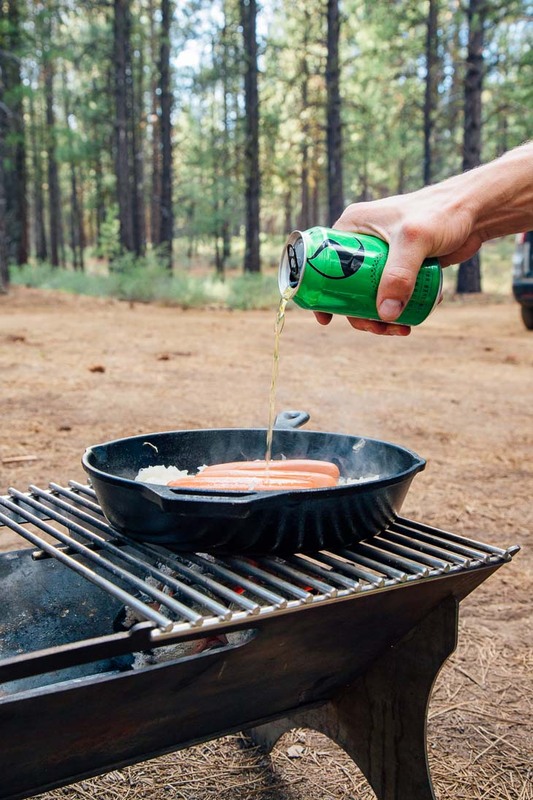 Or you can just use a cast iron skillet to sear your hot dogs. ProTip: If you use a cast iron skillet, we highly recommend using butter while searing! 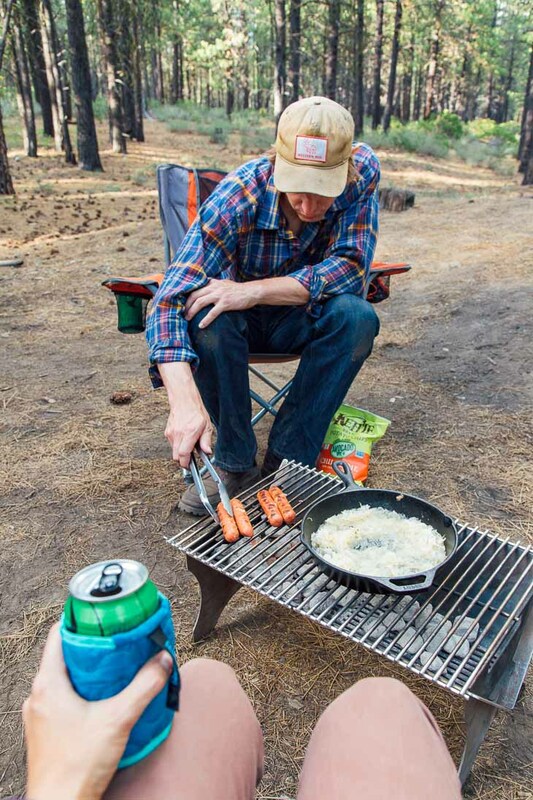 The Two Zone Heat Setup: The best way to cook hot dogs over a campfire is a two zone heat setup. That means one half of your grill is hot and the other is warm. Since most campfires have fixed grills, you’ll have to build or reposition your fire in a way to achieve this effect. As with virtually all types of campfire cooking, you want to be cooking over embers, not flames. Cooking over an open flame will result in burnt, burst skin, soot-covered dogs. So get your fire started at least an hour ahead of time and let it burn down to a nice bed of embers. Or, if you’re short on time, pack along a bag of charcoal. Poach, Then Grill: Taking a page from Kenji Lopez-Alt’s book from Serious Eats, we’re big fans of the poach first, grill second approach. This is more critical for sausages, but it has a lot of benefits for hot dogs too. The idea is you get a container (disposable aluminum baking pan or high sided cast iron skillet) and poach the hot dogs in a liquid base. We’re fans of dumping in a jar of sauerkraut, a can of beer, and adding in some mustard. Place this over the hot section of your grill and bring it to a light simmer. This will bring the hot dogs up to temperature, keep them plump and juicy, and infuse them with some additional flavor. When you’re ready to grill, move your container to the warm section of the grill and then pull out your hot dogs and place them on the hot side of the grill. You just want to get a nice even char the outside without breaking the skin casing. Once the dogs are done, you can either serve them immediately or return them to the container to keep them warm (this is a great tip if you’re cooking a lot of hot dogs for a group!). Stick Roasting [Alternate cook method]: We’ve had mixed results using this method, but if you want to roast your hot dogs over an open fire using a stick here’s our advice: wait until you have embers to cook over. We can’t stress this enough. Use a stick with two prongs otherwise, your dog will spin on the axis and you’ll have limited control. Better yet, use a hot dog basket like this, which exposes all sides of the hot dog to the flame. Be patient and go for medium sustained heat. High heat will risk bursting the casing and releasing all the juices. New England Style Top Sliced Buns: We haven’t eaten enough brands of hot dogs to have a strong opinion which is better, but when it comes to buns, we have some thoughts! New England style top-sliced buns are a structurally superior hot dog conveyance system than the most widely available side sliced buns. Top sliced buns (most commonly used for lobster rolls) have a flat base, so they can be placed on a plate and not roll over. They also have a much slimmer profile, so won’t ever end up with a disappointing mouthful of just bread. If you can find them, get top-sliced hot dog buns! They’re worth it! Grill buns on the outside: Here is an area that’s flummoxed us for years: how to toast the inside of your hot dog buns? The answer is you don’t. We’ve split dozens of buns over the years trying to perfectly splay them out on the grill in order to get the inside. It’s far better to just grill the outside of the buns (which is very easy when using the previously mentioned flat sided, top sliced buns!). Besides, you want the inside of the bun to be as flexible as possible to accommodate all your toppings. If you’re using a cast iron skillet or griddle, a real pro level way to prepare your buns would be to toast them in a little bit of butter on both sides. While this topic is hotly contested across the internet, we believe this to be the ideal sequencing for layering your condiments. But first things first. Put the hot dog in the bun. Wet condiments go on first in the cracks along the side. We like a thick bead of mustard down one edge and a thick bead of relish down the other. Chunky condiments like diced onions and sauerkraut go on second. Featured condiments go on last, think shredded cheese, pickled jalapenos, etc. 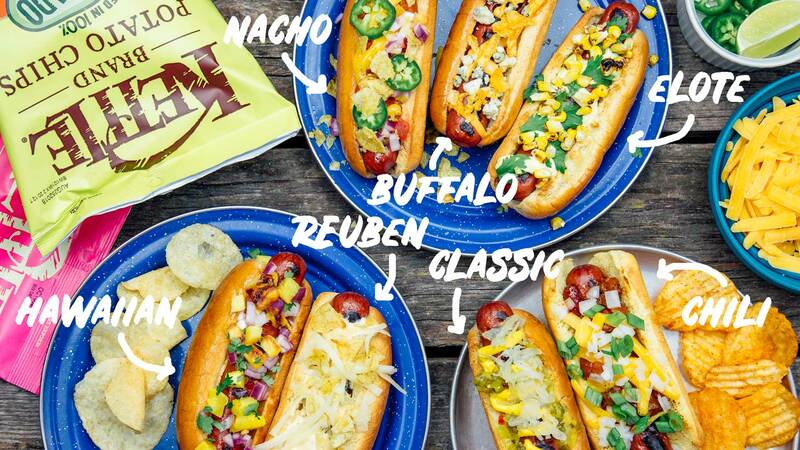 While these are all classic hot condiments, we believe there’s one topping which is often left out but can really bring your hot dogs to the next level. And it’s usually sitting on the plate next to your hot dog. A few crumbled potato chips layered on top of your hot dogs adds the missing crunchy element that completes the textural spectrum. We’re big fans of Kettle Brand chips as they come in a wide range of amazing flavors – nearly all of which pair well with a hot dog. So if you feel like your hot dog is missing something, we suggest adding some crunch! Yummy article! Our tradition is when camping, one of the days to be a hot dog day! This is a great post. Love everything about it. Going to definitely try the chip on top of the dog. And starting and finishing in the kraut is genius. Thanks guys! These sound delicious! My wife and I are always trying to find ways to make hot dogs a little gourmet. Thanks for the ideas! Great website! I love that grill. Any guidance on where to pick one up? Thanks Rob! The grill is by Fold A Flame. It’s been great to use while camping at sites that don’t have a built-in firepit. Thanks for the ideas, we prefer Koegel hot dogs with the casings and the split top bun was a must.